Advantages: An examination of Russia’s jack of all trades maritime helicopter. In the early 1970s, the higher command of the Soviet Navy realised that the Ka-25 Hormone, the then standard shipborne helicopter of the Fleet, was going to remain limited in its capability. Particularly short-ranged, the Soviets saw that to be effective an improved design was required. Commencing in 1973, this was to come in the form of the Ka-27 Helix, a larger and more powerful design that has formed the basis of many Russian ship and shore based utility and specialised helicopters since. Red Star Series Number 29 is devoted to the Helix family, covering this helicopter in all its forms from the 1970s to the present day. As with all the Red Star series this volume covers initial concept, development of the various types, in-service history (both military and civil) and exports. 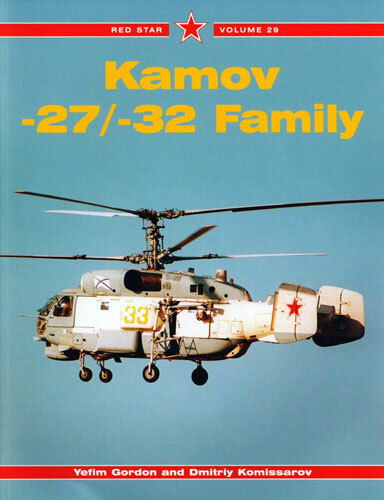 Rich in colour and with detailed text, one is given an excellent understanding of both the military variants of the Ka-27 and the civilian Ka-32, which has been widely exported. The prodigious output of Eastern European companies such as Zvezda has resulted in several variations on a theme in 1/72 scale giving the modeller some options for the Ka-27 family. This book is a must for anyone who wishes to take one of these kits and produce an accurate scale replica. Recommended for fans of Russian aviation types.